A break in both hands? I have breaks in both my palms, it doesent hook back towards venus, & theres not that space between both the lines in the break in both hands. what does this mean? can anyone tell age of the break from this pic, or do u need another set of pic? Re: A break in both hands? Cannot see any break in any of the three lines. Post full palm snap to see. What is your age and are you right or left handed? 19/20 and second one 26.Full Palm snap would have given more accuracy. What happened to you at that time. Give me a feedback to my last reply. can u help tell me the age Pravin? 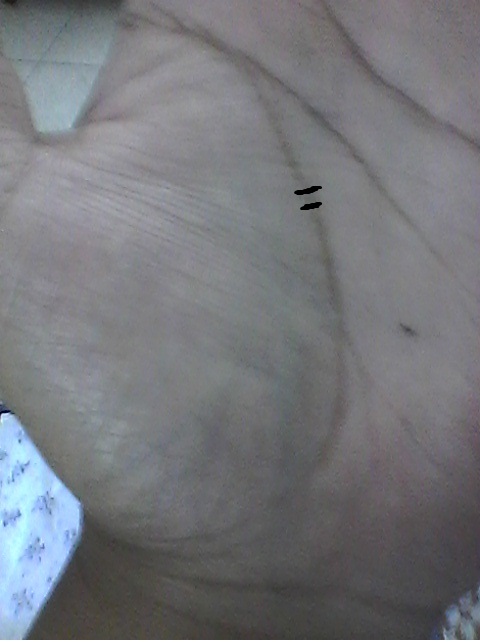 henryalfred wrote: I have breaks in both my palms, it doesent hook back towards venus, & theres not that space between both the lines in the break in both hands. what does this mean? Thank you for submitting your request. Unfortunately the photos do not present enough quality to confirm your observation; however, in my perception there are no clear 'breaks' inside the life line... and instead I can not rule out that this concerns 'colour' issues inside the line - from the photo I can see that there are more sections in the life line where the colour is lighter than in other parts of the line. I hope this will become helpful somehow for you, especially if you are concerned about the features that you tried to describe (it appears to me that the issue only manifests significantly in the life line of your left hand, not in both hands). PS. This photo appears to confirm my observation (see my previous comment) regarding your first photos: there is no obvious 'break' inside your left life line. In the right palm there is no break in life line. In left palm in the first picture where there is no marking life line is quite dim between two influences lines cutting the life line. Probably that is where this marking was put by henry. No, in perception there is in both hands no obvious break at all. By the way, if you study henryalfred's photos by detail, then you should be able to notice (just like me) that his 'black markers' are actually located at different positions. Are you left handed? If not why that much worry about left. In left hand life line fades at three places for a duration ranging from 3 to five years. There is no such fading in right. Unless full palm pictures are there, pointing age will not be right. in the first photo with markers, i posted one different than the marker in second & one same. I want to know what the ages are only in the marks marked in the life line in this photo. Thanks for confirming that you presented the (black) markers inside your photos on different locations. Sorry henryalfred, all I can say is that in my perception there are no obvious 'breaks' inside your life lines at all; therefore it appears that your request for feedback on your life line results from an incorrect assessment (as your black markers do not reflect the actual structure of your life line). Your request for the ages involved with your markers therefore also becomes irrelevant; by the way, there are no confirmed reliable timing methods available (though being aware that many individual palmists do think that it is possible, this actually concerns an issue that can be associated with the superstitious/outdated branches of palmistry which have been debunked already in various topics at this forum). please tell me the age on life line at the 2 marked areas on life line. For age prediction you should have posted the full palm. It looks like 27 and 29. You have crossed 27.. It is not a break in life line.